Not all the work you create ends up being used. 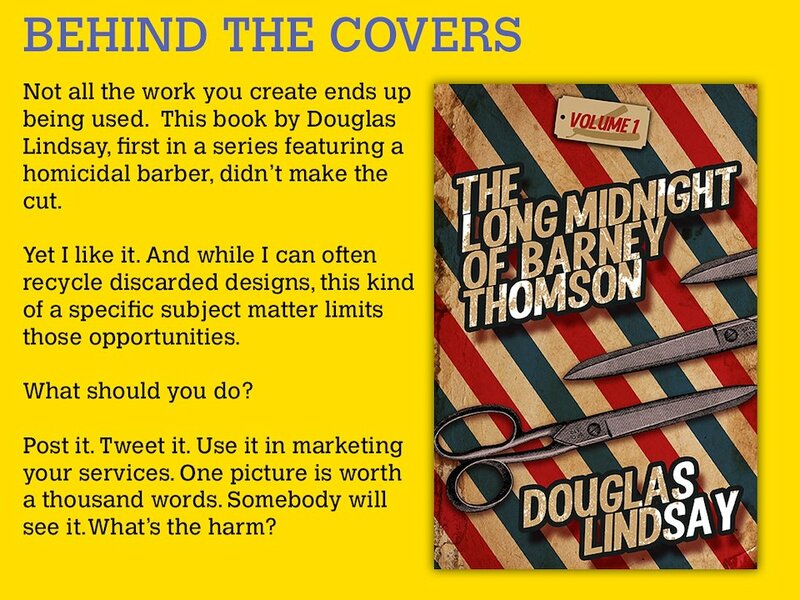 This book by Douglas Lindsay — first in a series featuring a homicidal barber — didn’t make the cut. Yet I like it. And while I can often recycle discarded designs, this kind of a specific subject matter limits those opportunities. Post it. Tweet it. Use it in marketing your services. One picture is worth a thousand words. Somebody will see it. What’s the harm? The book was since turned into a feature film starring Robert Carlyle and Emma Thompson. And I made several other covers for Douglas, before and after this cover. BEHIND THE COVERS: Knowing the author usually helps. 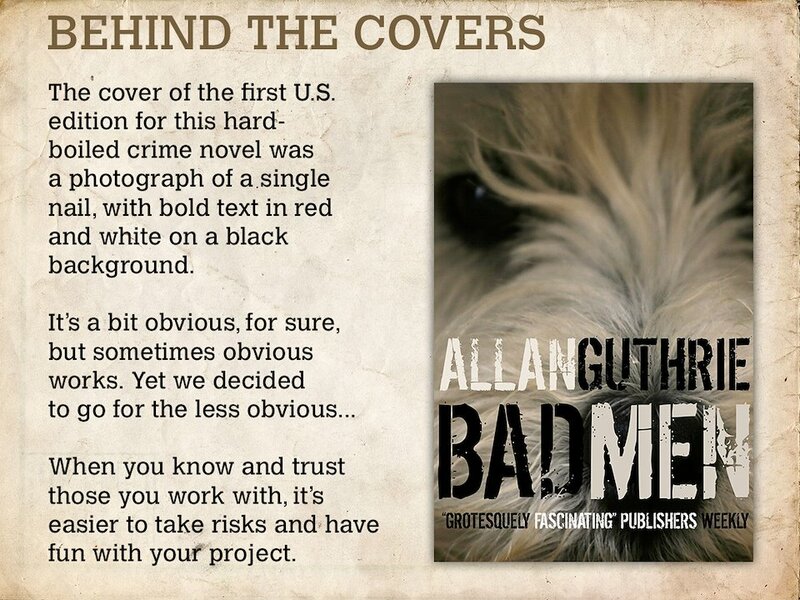 I’d worked with Allan Guthrie from his first novel on as an editor, publisher and cover artist. So when Al asked me for an ebook cover for this hard hitting (if hilarious) modern masterpiece in crime fiction, we knew it should be something different. The cover for the U.S. hardback had been a photograph of a single nail, with bold text in red and white on a black background. It’s a bit obvious, for sure, but sometimes obvious works. Yet we decided to go for the less obvious, as in showcasing the toughest character of all: a three-legged Dandie Dinmont terrier. This edition still finds new readers around the globe, five years later. When you know and trust those you work with, it’s easier to take risks and have fun with your project. BEHIND THE COVERS: For a long time I’d wanted to use typography as a design element and ignore the need for readability. 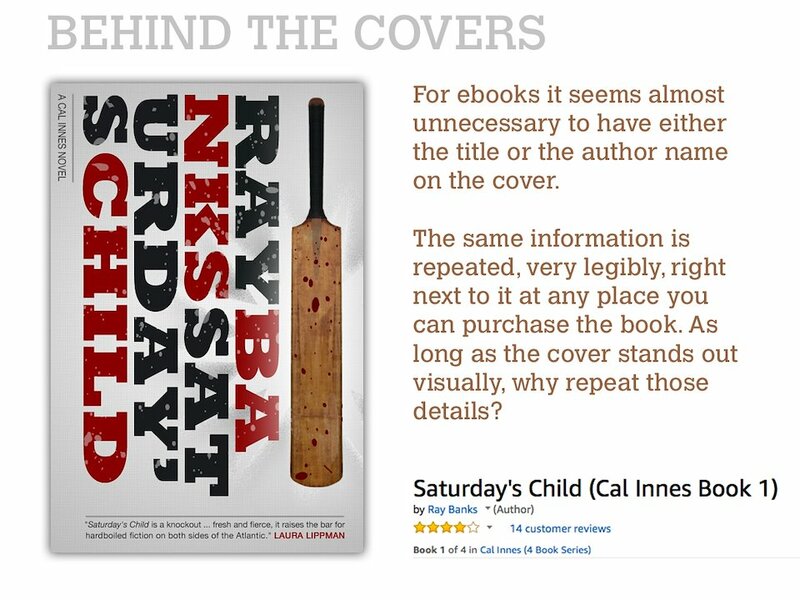 For ebooks it seems almost unnecessary to have either the title or the author name on the cover. The same information is repeated, very legibly, right next to it at any place you can purchase the book. As long as the cover stands out visually, why repeat those details? This cover, for Ray Banks and his Scottish publisher, Blasted Heath, accomplished just that. The three sequels followed the same branding, and a year or two later I did a cover for Ray that completely eliminated both the title and the author name. Is this the future? Probably not. But the covers stood out.